Garret Mountain Reservation in West Paterson, NJ has a reputation as a phenomenal site to observe waves of colorful migrants. Patrick of The Hawk Owl’s Nest and I met there this morning to find that, even when the birding isn’t phenomenal per se, it’s still pretty fantastic. Actually, Patrick already knew that, since he seems to have the entire Garden State wired as far as avian accessibility is concerned. Although the day was dreary and songbirds are just beginning to arrive in earnest, we amassed a sizable day list covering Garret Mountain and the nearby Rifle Camp Park. The morning started with Eastern Phoebe, Spotted Sandpiper, and Northern Rough-winged Swallow around a large pond. We picked up both northeastern orioles, Baltimore and Orchard, in short order. Next came American Goldfinches, Ruby-crowned Kinglets and Blue-gray Gnatcatchers, all common in this environment. As we proceeded, we noticed all the usual birds, including Gray Catbird, already starting its annual occupation of every bush and thicket in the Tri-state area. While we were enticed with tales of rarities like Orange-crowned Warblers, we encountered not a one, though a flyover of Common Raven seemed rather esoteric for this area. Nonetheless, there is an abundance of exceptional species filling the space between rare and common, and we saw plenty of them. The day’s identified raptor species included one vulture (Turkey), one falcon (American Kestrel), one owl (a Great Horned juvie), and three hawks (Red-tailed, Broad-winged, and Cooper’s). Of woodpeckers, there were five: Downy, Hairy, Red-bellied, Pileated, and Northern Flicker. Mixed in with the mobs of White-throated Sparrows still hanging around were Chipping, Swamp, and Song, not to mention Eastern Towhee and Dark-eyed Junco, one of whom is coming and the other presumably going. Hermit Thrushes were everywhere, but we did spot Wood Thrush, Winter Wren, and Brown Thrasher as well. “Brown” seems an inadequate description of the lively cinnamon plumage of this perpetually scowling thrasher. Sparrows and thrushes are nice, but in spring, we speak about warblers and the like, don’t we? While last week offered only Pine, Palm, and Yellow-Rumped, this weekend delivered the latter two of that timely trio along with a few familiar, but missed migrants: Black-and-white, Black-throated Blue, Yellow, and Northern Parula. In the rush to watch warblers, vireos are often forgotten, but the Blue-headed Vireos at Garret Mountain could not be ignored. These colorful songbirds, midnight-browed with sunlight at their sides, offered superior looks as they pillaged Tent Caterpillar nests along our path. While the day was ostensibly about greeting the birds of spring, the most memorable encounter was with a winter resident. A fearless, quite possibly insane White-breasted Nuthatch stalked us as we traveled down a wooded track, moving from tree to tree in order to remain at eye level as it waged its vertical war on the denizens of each trunk. Every time we moved, it followed, perching and braying its nasal call. In hindsight, I suspect it was trying, like some feathered Lassie, to alert us to a child that had fallen down a well. Instead of leaping into action, we just shot lots of pictures until, finally sated by crippling views of this peculiar bird, we left it to its chatter and moved on. I have to get to Garret Mountain sometime. 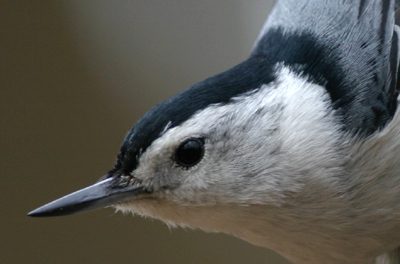 Note to visitors of Garret Mtn: Beware of rabid Nuthatch. Do not under any circumstances bring any form of nut to this location. Do not attempt to feed the bird. Simply run for your lives or just take pictures. Great day! We’ll have to do it again soon. “midnight-browed” what a great descriptor. Can I steal it some time? John, let me know when you plan to visit. In any case, be sure to heed Patrick’s warning about the nuthatches. We will, Patrick, no doubt about it. We were at Garrett this morning for a run, first time. We saw a turkey, a woodpecker (unknown), chipmunks, deer, grass birds, and a very large brownish red hawk. Unexpected and much appreciated wildlife.